Gemtopia is a stunning slot machine by Realtime Gaming (RTG). As the name may suggest, the slot game features a vibrant Gem theme. So expect to see colourful, glittery 3D gems and jewels in different forms and colours. The five- reel, 15 payline slot game has great bonuses and hefty payouts for Mzansi gamblers. Read on for more on the gameplay and special features of Gemtopia slot. Gemtopia is filled with precious stones which are specially designed to pay South African players for finding them across the screen. On the welcoming sight you will see diamonds, opals, rubies, emeralds, pink diamonds and sapphires. The slot machine is also packed with some special features that include a free spins round with bonus rewards and a wild re-spins. The pink diamond represents the Scatter symbol and is essential for triggering the Free Spins feature. South African players get 15 free spins when they land three or more of these scatter symbols on the second, third and fourth reels. Additional Bonus gemstones get added to the reel set during this feature, and should you land at least three of these icons you get three extra free spins and mind-blowing real cash reward up to 1000x the stake. The Wild symbol in the game is represented by a white diamond. When collected, the white diamond triggers the free re-spin feature. Mzansi punters can re-spin the reels free of cost given that they land three or more of these wild icons. 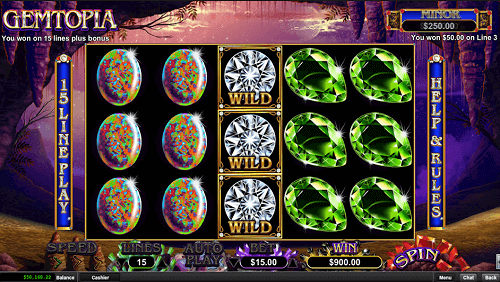 More so, like in most slot games, the wild also acts as a substitute to all other symbols except the scatter and bonus symbols. Gemtopia also boasts progressive jackpots which are randomly triggered and are up for grabs after each spin. These are the Minor and Major jackpots too see SA players smiling all the way to the bank. 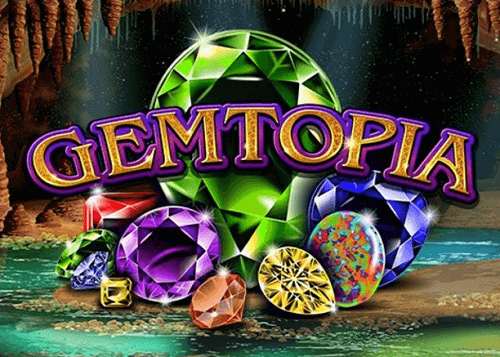 Gemtopia is the go-to slot if you’re looking for a fun and very rewarding gambling experience. The 3D graphics and sound go well with the overall theme. For such reasons, including the incredible bonuses featured on the slot, we rate Gemtopia online slot 4 out of 5 stars. Try it out at top South African casinos online listed on our site!